Home › Social Media › Social Media:- Is it a positive or negative for a person’s spiritual journey? An In-depth Analysis. Recently I wrote a paper on the impact of Social Media on a person’s spiritual journey: I titled the paper Christianity v’s Clicktianity. Hope you get something out of it. Objective: To provide an analysis of the role, both positive and negative, that social media is playing in the spiritual journey of Christians and Non Christians, drawing a conclusion as to what strategy a Missional Church should take in light of the evidence. Section 1 Framing up Social Media. Ever since Jesus sent out the disciples in twos, to carry the message of the Kingdom, via word of mouth, to a world desperately in need of salvation, the gospel has been transmitted socially. With the era upon us of Hyper-connectivity and the Social Media Revolution fast changing our world, is this a boom time for the Gospel and its STD orientation – Socially Transmitted. Discipleship? Or does Social Media in fact present a significant impediment to the gospel and the producing of fully devoted followers of Christ. This paper seeks to answer those two questions. “Facebook:- why would you?”With those often uttered words I successfully shrugged off another casual inquiry as to whether I was on facebook. It was October 2009 and my attitude toward Social Media was at best cynically negative. Secretly I was proud that I had successfully resisted and outright refused to get onboard the latest fad, that I was sure would last two years and fade back into the cyber oblivion from whence it had emerged like some grotesque swamp monster that fed on people’s time and their deformed egocentric need to live their lives totally exposing themselves to anyone who cared to accept their friend request. Then a Pastor friend of mine sent me a four minute Youtube clip titled Socialnomics. Here is a link to the clip. Within a week I had started a Facebook Profile and a Twitter account and thus began a journey for me as I realised the potential of Social Media to influence people for good and for God. The objective of this paper is to analyse the evidence, look at the stories and come to a conclusion whether ultimately Christians and Non Christians alike are assisted in their spiritual walk by Social Media. There are 750 tweets every second. 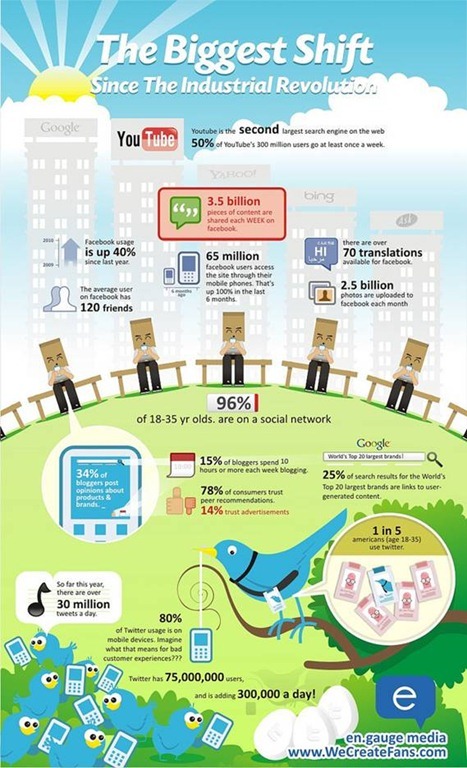 There are over 200 million blog sites. On Instagram there are 575 likes per second. The most viewed single video is Gangnam style by Psy and its had 857 million views. Kony 2012 which was a Social Media phenomenon in March of this year has had 94 million views. All this leads to the very obvious conclusion that there has been a seismic shift in the way we communicate and that we are now very much a hyper connected community. What has been the driver behind this rapid rise of social media? Professor John Drane in his book the McDonaldization of the Church, where he addresses the Church’s tendency toward pre-package spirituality, concludes toward the end of the book, that people are looking for two things – to be valued and to belong. (2001 Page 185). Jesse Rice in the book, The Church on Facebook, says that the hyper rise of Facebook is due to people’s need to belong. (2009 P33). A similar observation is made in The Gospel in Cyberspace by Babin and Zukowski;- “Belonging is more important than intellectually adhering to a message”(2002 P62). The question is, does all this “belonging” contribute to a person’s spiritual journey positively or negatively? Before we answer that question, we need to define a Theological position for being involved in Social Media. I could go down the pathway of assessing whether Social Media is morally neutral or not. Whilst this would be an interesting diversion, it would none the less be just that, a diversion. Brad Kallenberg in God and Gadgets, deals with that particular topic comprehensively and his book is certainly a worthwhile intellectual outing. Back on topic:- I believe that God is everywhere in culture and so we can find him in Social Media. On the Website Religion-Online, in an article titled “A Theology of Communication” by William Fore, a definition of communication is given as:-“ communication is the process in which relationships are established, maintained, modified, or terminated through the increase or reduction of meaning”. The article goes on to say:- “ All of creation is potentially a mediator of divine disclosure, but the church is the community which possesses the greatest potential for communication about God. According to Avery Dulles, The Church exists in order to bring men into communion with God and thereby to open them up to communication with each other. This task is variously called mission, evangelism, or education.” If we marry those two statements with the fact that Christ told his disciples to go into all the world in Matthew 28 – Social Media is one way we can be used by God to communicate divine disclosure. 1) Social Media is about relationships and as people connect, relationships are strengthened which then opens people up to the influence of their network of friends. As Christians share their stories about their spiritual journey, this can be a key influencer for people who do not yet know Christ. This is in contrast to Blast media such as TV and Radio that blast out their message without relationship. 2) According to the site Pro-Con.org, 60 million Americans received help with major life issues through their online social networks. Whilst the term”help” is not defined it shows that people are looking to those in their Social Media networks for advice. This sets the foundation for Christian’s within the network to share Christ where appropriate. 3) Social Media can be a powerful tool for social change. During the protests of the Iranian election in June 2009, protestors used Twitter to circumvent government control over phones and the media. Twitter was so important that the US State Department asked Twitter to delay a network upgrade that would have taken the website offline at a busy time of day in Iran. Twitter complied and rescheduled the downtime to 1:30 am Tehran time. The ability to remain anonymous helped protect people who were spreading information in real time. The potential for Christians to use Social Media as part of the reformation away from the Attractional Model of doing Church to a more Missional model, is significant. In fact Social Media is a great medium for Christians to increase their Missional engagements. 4) With the Missional Model, the philosophy is Go and Be. This is opposite to the Attractional Model which is Come and See. As Christians live their lives, to some degree on show on Social Media, they are showing their friends what it means to “Be” under the influence of the transformational power of Christ. From a Missional perspective, the potential for Social Media to be used as a tool through which people connect with those who don’t yet know Christ, is significant. 5) Blogs can be a great source of information for a Christian and can give them access to some of the great thinkers of the church world today. I personally feed myself spiritually on other Pastors Blogs regularly. 6) Yotube can also be a source of spiritual teaching for the discerning disciple. Whilst there is certainly a lot of rubbish on the website, there is also some fantastic deep teaching by Pastors and Professors, that a normal every day Christian may not have access to and certainly not for free. There are also plenty of resources for the searching non Christian. 7) Blogging can also be used by preachers who blog their sermon notes helping to increase the effectiveness of the preaching. Here is an example of my sermon notes on Atheism – Attack of the Theophobics. 8) Churches can use Social Media to Pastor people in their church. One of the unusual aspects of Millennials is their tendency to overshare on Social Media. This allows the Pastoral Team of any Church to walk with that person who is going through a hard time. 11) Social Media can bring ministry groups, study groups, and those with like interests together for discussion, debate and events. Sometimes a group can’t meet face-to-face, but could connect via a social networking site. 12) Social Media can be used by Christians to enhance the sermon experience. 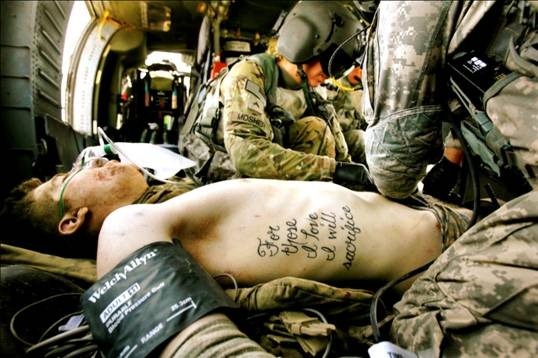 Recently I was in a conference and a Canadian preacher, Leon Fontaine was talking about Sacrifice and he told the story of a US Marine who was made famous in the following photo due to the poignancy of his tattoo. In this photo, he was being medivacked out of Afghanistan after stepping onto a landmine just outside Haji Ramuddin and having his two legs and left arm blown off. By the end of the sermon, I had Googled the story, found out who this guy was, (Kyle Hockenberry) located him on Facebook, sent him a friend request and sent him a message to encourage him and let him know that his story is inspiring people on the other side of the planet. Now all that sounds like I wasn’t listening, yet of all the sermons I heard at the conference in September of this year – this one by Leon, is the one I can still remember. The clip is about Joseph Kony, the leader of the LRA in Uganda and who is responsible for making thousands of children orphans and turning them into child soldiers. The clip has had 94,114,377 views. Now imagine for a moment that this video was preaching Christ. That’s an audience of 94 million people. 14) A church, a Pastor or a Christian can have a significantly larger audience to the message his life preaches:- through social media. For example, TD Jakes recently tweeted to his 485,000 followers:”Your words will tell others what you think. Your actions will tell them what you believe” It was retweeted 2490 times to an unknown number of millions. 15) As I have studied Theology and Popular Culture, I have come to the conclusion that God is everywhere in culture. There are many conversations on Social Media about the latest movies, music etc and a lot of these have embedded parallels that point to spiritual truths, which for the discerning Christian, is an opportunity to point God out in culture. 1) The digital disciple age may lead to Clicktianity. A version of Christianity where people think they are growing as a disciple but are not. There is a term in Social Media called Slacktivism. This is Social Media’s version of Activism. People wrongly believe that they are being activists because they like a page that demands American Airlines become Carbon Neutral. Or because they watch the Kony2012 video they feel outraged, they then think they have been part of the solution. This is slacktivism. Clicktianity is similar. A Christian likes a Facebook page that is titled We should tell all our friends about Jesus and they think they have done their bit for evangelism. Purely from personal observation, I have come to the conclusion that Clicktianity is epidemic on Social Media. Here is an example. See photo following. Second tweet down on the right. “Retweet if you love God. Remember he saw you read this.” So….the implication is that by retweeting it is an act of worship, or it is an act of response to the love of God. What if I don’t retweet? Are they suggesting that I am snubbing the Almighty? Are they saying that if I don’t retweet, God takes that as I don’t love him? 2) The third tweet from the bottom is another example of Clicktianity. Here is question? If I am not a Christian and I retweet the comment Retweet if you believe in God, Have I just become a Christian? Is that the same as lifting my hand in response to an Altar call in a typical Church? Further to the questions surrounding Clickianity, if a person is playing an online came like Second Life, where they have an avatar and interact with other avatars in a virtual world, if an avatar goes into a virtual Church and accepts Christ – is the person behind the avatar now saved? 3) The tendency to overshare on social media mean that when Christians are going through tough times, they often air their dirty laundry, which can mean that at times their lives are lived inconsistently with their Christian values. This can lead to non Christian friends growing in their cynicism towards the Christian message. I have witnessed this so frequently, that I wrote a blog on the topic, to teach Christian Facebookers in my church how to be a Christian on Social Media. 4) Some Christians view their network of friends on Social Media as gospel fodder and so they act super spiritual and forget the fact that Social Media is by definition Social. I have one friend amongst my Facebook friends, that anytime I post something, will respond with the word “Maranatha” which means O’Lord come. 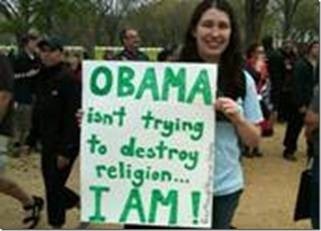 It’s a weird super spiritual response that she thinks is spiritual but just makes her look weird. Some Pastors I follow on Twitter, only post bible verses or leadership quotes and they are missing the point. One it’s meant to be social. Secondly, they just look weird, irrelevant and missing the whole point of Social Media. My conclusion is that Christians who treat their friends like gospel fodder actually do more damage to a person’s spiritual journey than good, particularly to the non Christians. A great statement was made in an article titled Facebook and Evangelism :-If you imagine Facebook to be a ‘pulpit for preaching’, you are wasting your time and likely to upset a lot of people. If you understand it to be a ‘cafe for conversation’, you will be in tune with its heartbeat. Some strategists have named inappropriate, strident, argumentative, manipulative or impersonal attempts to convince people of the truth with the chilling term un-evangelism. 6) There can be incredible hatred on Social Media. To illustrate my point, I recently posted a statement of fact on my personal Facebook wall, about the number of Asylum seekers that have come to Australia over the last 12 months, compared to the last 11 years. The post was delivered to a hate filled blog, where the title was put up – Nowra City Church Preaches Against Asylum Seekers – and then there was a frenzy of hate toward me. Following is my post on their blog and just two examples of the respondents. Note the fact that I made a comment of fact on a political issue and yet it became a Church thing and note the viciousness of the attack on my Christian faith. 7) The possibility of Anonymity of Social Media, as people start Troll Accounts or use unidentifiable user names, is also a problem for Christians on Social Media. The hatred and vilification of Christians by people who hide in the gutless cave of anonymity only emerging from the dark dank recesses of their cave to vomit their filth and hatred over Christians and then run and hide. This leads to the issue of cyber bullying, which is becoming an increasing issue in Australia. The following news article is taken from the ABC News Website and is dated the 23rd July 2009. A Melbourne mother has blamed her 14-year-old daughter’s suicide on the internet and the tragic case has highlighted the problem of cyber bullying among young people. In Australia, one of the first comprehensive studies of cyber bullying shows about 10 per cent of teenagers and children have experienced some form of sustained bullying using technology. It is a behaviour that can have tragic consequences. Speaking on Melbourne radio, mother Karen Rae is in no doubt that cyber bullying was responsible for the death of her 14-year-old daughter. “Friday night she was on the Internet and told me about some message that had come through, and she wanted to die because of the message,” Ms Rae said. “I laid in bed with her in my bed and we discussed it for about an hour and she left me fairly happy. I can guarantee you if she didn’t go on the Internet Friday night she’d be alive today. “The girl’s death has devastated her family and friends and has dramatically brought to the fore the impact of cyber bullying. How sad that bullying on Social Media has led to the death of a young lady. This story illustrates the negative power of Social Media and if it can cause the death of a person, the potential for bullying etc to damage a person’s spiritual journey is enormous. 8) One of the significant challenges that a Church community faces in a Post Modern world is that of the deification of the Individual. It flows hand in hand with radical consumerism where Christ goes from being Lord to Label. Social Media reinforces narcissistic tendencies in people which can be a significant hindrance to them accepting Christ. Or if they do, they can find it difficult to become a member of a Church community, where sacrifice, serving, giving and being others focussed is the DNA. 9) One of the Characteristics of Post Moderns is that they reject absolute truth and so therefore truth becomes a social construct. Social Media then can be a powerful source of “truth” to the Post Modern, but that indeed may not be truth. 10) Speaking of truth, another down side to the Social Media is that there is a deliberate and articulate attack on Christian truths. Famous Atheist Christopher Hitchens coined the phrase “New Atheists” and he defined these new atheists at being Anti-Theists. 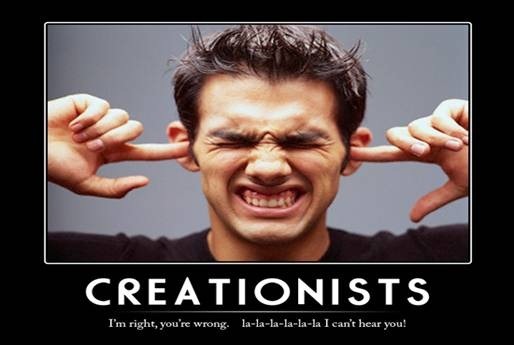 Not content to not believe in God or a god, but they are out to destroy the faith of Theists. You don’t have to scratch the web or Social Media too deeply to find sites and profiles dedicated to destroying people’s faith as they mock Christ, mock creation and mock Christian’s apparent rejection of faith. Here are a few pictures of one Facebook page that I recently came across. 11) Social Media Addiction is becoming an increasing problem that like any addiction has negative social and spiritual consequences. Reliable Empirical data is hard to find as Social Media is so new. Of the articles that I read the average estimate of Social Media Addicts is 19% or 200 million people on Facebook and 100 million on Twitter. 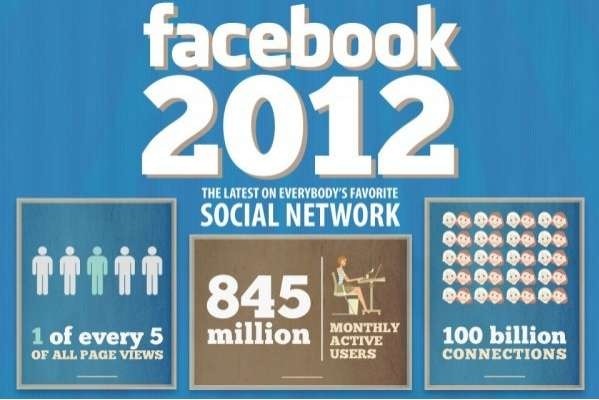 Americans spend on average 53,457, 258,000 minutes on Facebook each month which is the equivalent of over 100,000 years. The impact this addiction has on a person’s spiritual journey is unknown at this stage, but logic dictates we can draw some conclusions that its not going to be a healthy thing – particularly if there is a tendency toward addictive behaviour. I asked on my Facebook wall, whether people thought that Social Media helped their walk with God or not and multiple people said that it takes them away from reading the bible and prayer. My personal experience is similar. I can’t sit at my office desk and pray and read the Word, as the four computer screens I have sitting in front of me, call to me like the seductive sirens from the story Odyssey. Gordon College, a Christian Liberal Arts college in Boston, MA, did a recent online survey with 1,342 Christian college students wanting to know the positive and negative effects of social networking. This study is reported on on the ChurchLeaders.com website in an Article titled Would Jesus Be on Facebook. The study showed that 30% of Christian college students in the study spent 1-2 hours a day on Facebook, with 12% going at it for 2-4 hours each day. This did not include Twitter, email, texting, and other webpage browsing. Added up, we have a significant amount of time networking with friends in the wireless world. The study raised more questions than answers, but it did find from those surveyed that over half admitted to “neglecting important areas of their lives” because of time on Facebook. Another 12% of these Christian college students believe they are addicted to some form of electronic media. Finally 21% felt that their level of engagement with electronic media including Facebook caused conflict at times with their Christian values. 12) There is tendency for people to overshare on Social Media. It’s an interesting perception that people have that just because they are typing in the privacy of their bedrooms or lounge room they can share really private information. A significant observation was made on the US Catholic website in an article titled Building and Sustaining Communities in a World of Social Media:- “We cannot yet fully understand the consequences of our “honest teenage selves” existing online forever because social media hasn’t been around that long yet. It will take several generations for us to appreciate the impact. Could a minor infraction on the road of life do irreparable damage”. And what impact does this have on our reputation, discipleship and future leadership potential. 13) Brad Kallenberg made a poignant observation in his book God and Gadgets. “When Christians dream about using Technology tools to expedite the Great Commission, they instinctively employ “efficiency” as the metric. What makes a tool “good’ supposedly, is calculated in terms of how much information can be disbursed across a wide population in the least amount of time and for the least amount of money” (Kallenberg 2011 P68). Kallenberg goes on to say that evangelism is not a matter of efficiency. I personally believe this is one of the most common negatives that the Church world and indeed the Christian, can fall into, assuming Social Media is a good outreach tool simply because it is efficient. 14) Economic Reductionism is the final negative that I will address here. It needs to be remembered that Social Media sites were not started to help people connect. They were started to make money. They are run by capitalists and they sell people’s personal information and interactions to the highest bidder who then market to them. From this perspective, all the social interaction is reduced down to a depersonalising economic equation. I don’t think this is a particular positive thing for a person’s spiritual journey for a number of reasons, one of them being that it strokes the fires of consumerism in very a targeted way. “In the past missionaries left their own country to live in a local situation, incarnating the message with unbelievable heroism. Today the situation of the global village calls every Christian to be a missionary in a new way, to leave one’s country while remaining in ones land. This is a worldwide type of incarnation” (2002 P82). Thus the era of the digital missionary is born. My Parents were missionaries in Papua New Guinea for 6 years. The potential that Social Media presents is that I will be able to far exceed the number of people they reached in a shorter space of time, across a broader area of the planet. Social Media does have some negatives attached to it in terms of the impact it can have on someone’s spiritual journey. And those negatives are significant and should not be ignored. However the positives present an opportunity that is not outweighed by these challenges and my conclusion is that we are to be digital missionaries, going viral in a world that is increasingly taking place in a cyberculture that still requires spiritual redemption. Social Media has brought a communication revolution to the world and this seismic shift in the way people communicate, presents both positives and negatives to the people and their spiritual understanding. Even though the negatives are significant, the positives present an awesome opportunity to further the gospel, which Christ established as being transmitted socially. The key is to not be ignorant of the challenges and go in blindly, but to be wise as serpent and harmless as doves. This will enable us as Church leaders to steer people away from Clicktianity and onto being fully devoted followers of Jesus Christ – true Christianity. If you would like to donate to my ministry: Here are my bank details. If this Paper has been helpful, informative, or inspirational to you, please feel free to share it on Facebook or Twitter. Email Subscriptions to my blog are welcome or you can contact me through Facebook (facebook.com/peter.pilt5), Twitter (@PeterPilt) or Insta (@PeterPilt). Have a great day. Pastor Peter Pilt Doesn’t Believe In Digital Jesus to Digitally Save Him. So helpful, looking ahead to coming back. homeopathy is usually an eye-opening encounter. advantageously aforementioned buddy, selfsame advantageously.